Apple Music for Android beta with tablet interface. 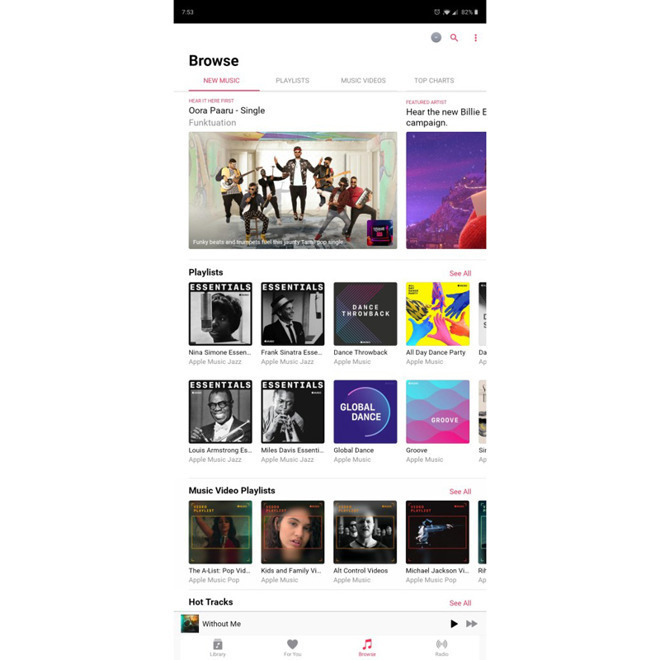 Version 2.7.0 of Apple Music for Android first went into beta last December, previewing the new tablet interface that takes full advantage of larger-screened portables. The UI not only packs in more onscreen items, but also allows users to browse categories like playlists and music videos without having to open those sections of the app separately. A new navigation bar in the Browse section also lets users jump to popular categories without digging into Apple Music's menus. Today's release also includes unspecified app and performance improvements. The last major update to Apple Music for Android rolled out in August 2018, with that version adding support for Android Auto. Android typically nets new functions and features months after Apple Music for iOS, and tablet support is no different. Apple initially launched Apple Music for iPad alongside its iPhone counterpart in 2015. The latest version of Apple Music for Android is available to download on the Google Play store.